For a long time drench resistance was only considered a problem for sheep producers. 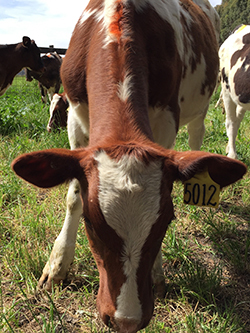 Recent work on dairy farms in Gippsland and South-West Victoria has shown that resistance in cattle worm species (particularly stomach worm Ostertagia) is common to all classes of anthelmintic products. The study in Maffra dairy farms showed 100% of farms had resistance to Panacur (BZ drenches), 44% resistant to Nilverm (Levamisol drenches) and 33% resistant to mectin (ML drenches). Of greatest concern, the farms with demonstrated resistance to the mectins had resistance to all of the drenches. Given there are no alternative drench products on the market or likely to be in the medium term, these statistics send a clear message to the entire industry that prudent use should be a priority. This has been a wake up call to ensure that we are using drenches for worm control in the most effective way. The sheep industry has dealt with this issue for over 20 years, and many of the management processes adopted by this industry in the face of anthelmintic resistance are now routine amongst producers. Drenches given too frequently, or especially at high risk times of the year (drenching in late summer when not indicated) can influence how quickly resistance can develop. The concept of leaving some non-resistant worm eggs to dilute any resistant worm eggs (“refugia”) is a management strategy that is now in favour to limit the impact of resistance on farm. Drench cattle only when they need it. Before routinely drenching young stock an assessment of faecal egg counts (FEC) will identify whether the herd needs it. Drenching should be done when it will have the most benefit to the herd, and to limit the opportunities for resistance to develop. Cattle develop immunity to worms. Cattle develop a strong natural immunity to worms, so it is young stock who are most at risk of worm burdens which cause production losses. Under normal conditions, it is not necessary to routinely drench adults over three years of age. It is a far more effective strategy to assess worm status of your herd prior to drenching, than for drenching to be a strategic annual calendar event. Well grown, seasonally well fed young stock which meet target live weights have the best opportunity to develop immunity quickly. Well grown stock in good body condition are more resistant to worms. Routine weighing of heifers to ensure they are meeting targets for growth and reproductive management is one of the most important management tools available. Weigh time also provides the perfect opportunity to get the faecal samples needed to monitor the FEC and assess whether drenching is required. Seasonal variations throughout the year and from year to year influences the requirements and timing of drenches. Because worms live part of their life on pasture and part inside the cattle, seasonal variations from year-to-year influence worm burdens on pasture. The timing of drenches should reflect the conditions occurring for each season. Late summer drenching, in particular, is one of the high risk practices for resistance. Assessment of worm burden through FEC before drenching at this time is highly recommended. Patterns in FEC over time allow intimate knowledge of the seasonal influences on worm populations on individual farms. This will allow better individual forecasting of the seasonal changes which herald changes in worm burden. Drench resistance testing is available and should be considered if resistance is a concern on your farm. FEC prior to and 2 weeks after drenching can assess how effective a drench has been, and will highlight any potential resistance issues. Worm testing kits are available from The Vet Group. Each kit comes with full instructions and a bulk test will allow for 5-15 animals to be sampled. The cost for a bulk test starts from $65.85 including a drenching advisory report. Call 1300 838 700 to arrange a kit for your farm, or book one of our vets and techs to do it for you.